Association Sportive Nancy-Lorraine is a French association football club based in Nancy, Lorraine. The club was founded in 1967 and currently plays in Ligue 2. Football Club Lorient-Bretagne Sud is a French association football club based in Lorient, Brittany. The club was founded in 1926 and will play in Ligue 2 in the 2017-18 season after relegation from Ligue 1 in the 2016-17 season. Lorient plays its home matches at the stade Yves Allainmat, former mayor of the city located within the city. The stadium is surnamed Stade du Moustoir because of his location within the city. The team is managed by Mickaël Landreau. Marveaux was born in Vannes, located on the west coast of the Brittany region, and began his career at local club AS Ménimur at age six. He starred for the club at various youth levels before departing for the biggest club in the city, Vannes OC. In his first year at Vannes, Marveaux was selected to attend the Pôle Espoirs Football de Ploufragan, a smaller regional version of the Clairefontaine academy. While training at Ploufragan during the weekdays, he played at Vannes on the weekends. Marveaux also trained alongside future Rennes teammates Yoann Gourcuff, Virgile Reset and William Stanger while attending Ploufragan. In 2001, after leaving Ploufragan, Marveaux signed an aspirant (youth) contract with Stade Rennais and joined the club's aspiring youth academy. Marveaux spent four years in the club's academy before earning a call up to the club's Championnat de France amateur team for the 2005–06 season. He was an undisputed started in the team making 21 appearances and scoring seven goals. Following the season, Marveaux signed his first professional contract agreeing to a three-year deal until June 2009. He was officially promoted to the senior team and assigned the number 26 shirt for the 2006–07 season. 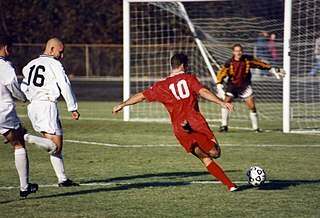 Stade Rennais Football Club, commonly referred to as Stade Rennais, SRFC or simply Rennes, is a French association football club based in Rennes. The club was founded in 1901 and currently plays in Ligue 1, the top tier of French football. Rennes plays its home matches at the Roazhon Park, located within the city. The team is managed by Julien Stéphan. The team's president is Olivier Létang and its owner is Artémis, the holding company of businessman François Pinault. Le Championnat 2006–07 was the 69th edition since its establishment. The competition took place on 4 August 2006, and ended on 26 May 2007. Marveaux made his professional debut on 5 August 2006 in a league match against Lille playing the entire match in a 2–1 defeat. Despite starting his first professional match, he was relegated to appearing as a substitute for the majority of the season by manager Guy Lacombe. Marveaux scored his first professional goal for the team on 14 October after appearing as a first-half substitute in a 3–1 win over Auxerre. Two weeks later, he scored an extra time goal in the Coupe de la Ligue against Lille after appearing as a second-half substitute. Rennes won the match 2–0. On 18 November, Marveaux converted a late equalizing goal in a 1–1 draw against Le Mans. He finished the campaign with 32 total appearances and six goals. Of the 32 appearances, Marveaux only made nine starts. Guy Hubert Georges Lacombe is a French former professional football player and manager. Marveaux began the 2007–08 season alternating between the bench and the first 11 as the player struggled to adapt to new manager Guy Lacombe. He finished the season with 24 appearances in the league and no goals. Marveaux scored his only goal of the season against Bulgarian club Lokomotiv Sofia in the first round of the UEFA Cup. His transition to Lacombe was further hampered during the 2008–09 season when, while playing with the France under-21 team, he suffered a torn hamstring injury. The initial diagnosis of the injury required no surgery, however, in October, it was discovered that the injury was severe after club doctors revealed that a hematoma had formed around the hamstring. Marveaux underwent surgery and, subsequently, missed five months. 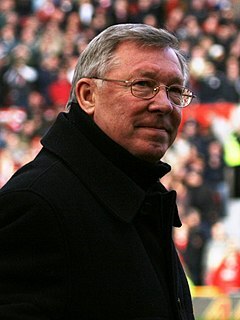 He returned to the team in May 2009 and appeared in the final three matches of the season. The 2007–08 Ligue 1 season is the seventieth since its establishment, and started in August 2007 and ended on 17 May 2008. The fixtures were announced in June 2007. Lyon became French champions, having won a record seventh consecutive title. The 2008–09 Ligue 1 season was the 71st since its establishment. Bordeaux became champions for the sixth time on the last weekend of the season. The fixtures were announced on 23 May 2008. The season began on 9 August 2008 and ended on 30 May 2009. A total of 20 teams contested the league, consisting of 17 who competed the previous season and three that were promoted from France's second division Ligue 2. For the 2009–10 season, under new manager Frédéric Antonetti, a healthy Marveaux thrived having his best season to date. Marveaux posted career-highs in all statistical categories. He scored his first goal of the season on 13 September 2009 in a 1–0 win against Saint-Étienne. The following week, Marveaux netted the second goal in a 4–0 thrashing of Grenoble. In the return leg against Grenoble in 2010, he scored a double in another 4–0 win. The following week, Marveaux was instrumental in the team's 4–2 victory over the defending champions Bordeaux. He scored the opening goal in the 7th minute and assisted on the final goal scored by Asamoah Gyan. In the Coupe de France, Marveaux scored two goals, both of which came in a 4–0 victory over amateur club Saumur in the Round of 32. He finished the campaign by scoring in a 2–1 defeat to Sochaux and a 2–2 draw against Nice. Marveaux successful individual season of 38 total appearances and 12 goals was overshadowed by the team's collective display as Rennes finished mid-table and failed to qualify for Europe after appearing in the UEFA Cup in back-to-back seasons. Frédéric Antonetti is a French football manager and former footballer. He is currently the manager of Ligue 2 side Metz. He scored his first goal for Newcastle in a 1–1 UEFA Europa League draw with C.S. Marítimo on 22 November 2012. He scored his first ever Premier League goal in the Magpies' fixture at Emirates Stadium against Arsenal on 29 December 2012, which Newcastle lost 7–3. The goal was a simple tap in after a good piece of work from teammate Gabriel Obertan. He then set up Demba Ba for his 2nd goal of the game with a sublime cross using the outside of his foot. Marveaux was born in France to a Martiniquais father and a French mother. Marveaux is a former French under-21 international having earned caps with the team from 2006 to 2008. 1 2 Appearance(s) in the UEFA Cup. 1 2 Appearance(s) in the UEFA Europa League. ↑ Appearance in the Trophée des Champions. Hatem Ben Arfa is a French footballer who plays as a winger and an attacking midfielder for Ligue 1 club Rennes and the France national team. Known for his dribbling ability, he has been described as "one of the best-rated talents in France", but has been criticised by the media and players alike for lacking discipline. Yoann Miguel Gourcuff is a French professional footballer who is currently a free agent. He operates mainly as an attacking midfielder, but can also be utilized as a withdrawn striker and is described as a "playmaker of real quality" who "is an accomplished passer of the ball". Gourcuff has been described by former French international David Ginola as the best French player of his generation. His talent, elegant playing style, tenacity on the pitch, technical skills and precocious ability have drawn comparisons to French legend Zinedine Zidane. Étienne Didot is a French professional footballer who currently plays for Ligue 1 club Guingamp. He primarily plays as a centre midfielder. His brother, Sylvain Didot, is also a football player and currently plays for Championnat de France amateur side US Avranches. 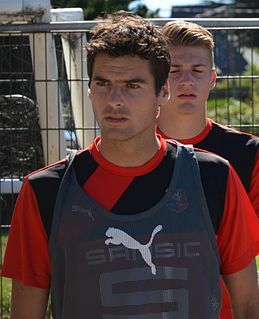 Didot has made over 400 appearances in Ligue 1 as of the 2017–2018 season. Loïc Alex Teliére Hubert Rémy is a French professional footballer who plays as a forward for Lille OSC. He was described by his former manager Didier Deschamps as "a young international who is fast and powerful with huge potential". André-Pierre Christian Gignac is a French professional footballer who plays for Liga MX club Tigres UANL. He primarily plays as a striker whose influence can extend out to the wings. 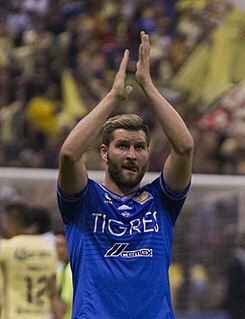 Gignac is described as a "powerful and dangerous" striker who is known for his "aerial presence". He is known personally by teammates and friends as simply Dédé. Kevin Dominique Gameiro is a French professional footballer who plays as a striker for Spanish club Valencia. Moussa Sissoko is a French professional footballer who plays for Tottenham Hotspur and the France national team. He plays as a box-to-box midfielder in the centre of the pitch, and is capable of playing in either a holding midfield role, or even as an attacking midfielder or right winger. Younousse Sankharé is a Senegalese professional footballer who plays for Bordeaux. He plays as a left-sided midfielder, but also operates as a left back. Marvin Martin is a professional footballer who currently plays for Reims. He plays as a creative play-making midfielder and is described as a player with "very good technique on the ball" and "excellent vision", which compensates for his relatively small frame. Martin is a former France youth international having starred for his country at under-21 level from 2008 to 2010. Yacine Brahimi is a French-born Algerian professional footballer who plays for FC Porto and the Algeria national team. He plays as an attacking midfielder and a winger and is described as a "technically gifted player". His coach, Frédéric Antonetti, declared Brahimi would be the "future play-maker of Stade Rennais". Yacine is also known for his "Brahimi Moments". Yann Gérard M'Vila is a French professional footballer who currently plays for French club Saint-Étienne. He operates primarily as a defensive midfielder, and is described by his former club as a player who possesses "excellent defensive abilities" and "impressive physical strength", but can also play as a box-to-box midfielder, due to his impressive work rates and stamina. He is the younger brother of Yohan M'Vila. Olivier Jonathan Giroud is a French professional footballer who plays as a forward for Premier League club Chelsea and the France national team. Franck Pascal Paul Tabanou is a French professional footballer who plays for Guingamp as a left-back. Tabanou is a French youth international having starred at under-20 and under-21 level. He played with the under-20 team at the 2009 Mediterranean Games. The 2010–11 Ligue 1 season was the 73rd since its establishment. Entering the season, Marseille were the defending champions. The fixtures were announced on 21 May 2010 and the season began on 7 August and ended on 29 May 2011. The winter break was in effect between 23 December and 15 January 2011. There were three promoted teams from Ligue 2, replacing the three teams that were relegated from Ligue 1 following the 2009–10 season. A total of 20 teams currently competes in the league with three clubs suffering relegation to the second division, Ligue 2. All clubs that secured Ligue 1 status for the season were subject to approval by the DNCG before becoming eligible to participate. In addition, German sportswear company Puma, whom the Ligue de Football Professionnel share a partnership with, provided a brand new match ball for the new season. The 2010–11 Coupe de la Ligue was the 17th edition of the French league cup competition. The defending champions were Marseille, who defeated Bordeaux 3–1 in the 2009–10 edition of the final. The competition was organized by the Ligue de Football Professionnel and was open to the forty-four professional clubs in France that are managed by the organization. The final was contested on 23 April 2011 at the Stade de France. The winner of the competition qualified for the 2011–12 UEFA Europa League and will be inserted into the third qualifying round. The 2013–14 Ligue 1 was the 76th season since its establishment. The season began on August 9, 2013 and ended on May 17, 2014. Paris Saint-Germain were the defending champions. As in the previous years, Adidas provided the official ball for all matches, with a new Adidas Pro Ligue 1 model to be used throughout the season for all matches. The 2013–14 season was AS Monaco FC's first season back in Ligue 1 since relegation from Ligue 1 in 2011. They finished the season in second place, reached the semi-finals of the Coupe de France and the Third round of the Coupe de la Ligue. 1 2 3 "Premier League Player Profile Sylvain Marveaux". Barclays Premier League. 2016. Retrieved 20 January 2016. ↑ "Total respect pour les frères Marveaux au tournoi de foot". Vannes Maville (in French). 28 December 2009. Retrieved 4 August 2010. ↑ "Sylvain Marveaux". Stade Rennais F.C. (in French). Retrieved 4 August 2010. ↑ "STADE RENNAIS RESERVE PRO 2005/2006". Stat2Foot (in French). Archived from the original on 13 June 2009. Retrieved 4 August 2010. ↑ "Rennes v. Lille Match Report". Ligue de Football Professionnel (in French). 5 August 2006. Archived from the original on 16 March 2007. Retrieved 4 August 2010. ↑ "Rennes v. Auxerre Match Report". Ligue de Football Professionnel (in French). 14 October 2006. Archived from the original on 15 March 2009. Retrieved 4 August 2010. ↑ "Lille v. Rennes Match Report". Ligue de Football Professionnel (in French). 26 October 2006. Archived from the original on 7 September 2012. Retrieved 4 August 2010. ↑ "Rennes v. Le Mans Match Report". Ligue de Football Professionnel (in French). 18 November 2006. Archived from the original on 18 March 2007. Retrieved 4 August 2010. ↑ "S. Marveaux opéré". Football365 (in French). 18 November 2008. Retrieved 29 December 2010. ↑ "Marveaux opéré en novembre". Sports.fr (in French). 21 October 2008. Retrieved 29 December 2010. ↑ "Rennes v. Saint-Étienne Match Report". Ligue de Football Professionnel (in French). 13 September 2009. Archived from the original on 28 March 2012. Retrieved 29 December 2010. ↑ "Grenoble v. Rennes Match Report". Ligue de Football Professionnel (in French). 20 September 2009. Archived from the original on 23 April 2012. Retrieved 29 December 2010. ↑ "Rennes v. Grenoble Match Report". Ligue de Football Professionnel (in French). 30 January 2010. Archived from the original on 23 April 2012. Retrieved 29 December 2010. ↑ "Rennes v. Bordeaux Match Report". Ligue de Football Professionnel (in French). 6 February 2010. Archived from the original on 23 April 2012. Retrieved 29 December 2010. ↑ "Saumur v. Rennes Match Report". Ligue de Football Professionnel (in French). 22 January 2010. Archived from the original on 23 August 2011. Retrieved 29 December 2010. ↑ "Rennes v. Nice Match Report". Ligue de Football Professionnel (in French). 8 May 2010. Archived from the original on 23 April 2012. Retrieved 29 December 2010. ↑ "Marveaux: "J'irai au bout de mon contrat"". Stade Rennais F.C. (in French). 16 July 2010. Retrieved 29 December 2010. ↑ "Chelsea eyeing Rennes attacking midfielder Marveaux". Tribal Football (in French). 20 May 2010. Archived from the original on 6 April 2012. Retrieved 29 December 2010. ↑ "Hammers target Marveaux to stay at Rennes". ESPN . 22 June 2010. Retrieved 29 December 2010. ↑ "Rennes v. Lille Match Report". Ligue de Football Professionnel (in French). 7 August 2010. Archived from the original on 15 November 2010. Retrieved 29 December 2010. ↑ "Rennes v. Toulouse Match Report". Ligue de Football Professionnel (in French). 3 October 2010. Archived from the original on 15 November 2010. Retrieved 29 December 2010. ↑ "Sylvain Marveaux out until 2011". Ligue de Football Professionnel . 24 November 2010. Retrieved 29 December 2010. ↑ "Marveaux KO". Sport24. 23 November 2010. Retrieved 29 December 2010. ↑ "Marveaux Agrees Terms With United". Newcastle United FC. 18 June 2011. Archived from the original on 19 June 2011. Retrieved 18 June 2011. ↑ "Marveaux Snubs Liverpool To Join Newcastle". Newcastle United FC. 18 June 2011. Archived from the original on 23 July 2012. Retrieved 18 June 2011. ↑ "Scunthorpe 1–2 Newcastle". BBC. 23 August 2011. Retrieved 18 November 2011. ↑ "Newcastle2–1 Everton". BBC Sport. 5 November 2011. Retrieved 18 November 2011. ↑ "Marveaux to face operation". Newcastle United FC. 18 November 2011. Archived from the original on 21 November 2011. Retrieved 18 November 2011. ↑ "Newcastle 1–1 Maritimo". Newcastle United F.C. 22 November 2012. Retrieved 22 November 2012. ↑ "Obertan And Marveaux Leave Newcastle". Newcastle United F.C. 5 May 2016. ↑ "Sylvain Marveaux (Newcastle) a rejoint En Avant" (in French). EA Guingamp. 22 July 2014. Retrieved 22 July 2014. ↑ "Trophée des Champions - Saison 2014/2015 - Finale - Paris Saint-Germain / EA Guingamp" (in French). LFP. 2 August 2014. Retrieved 3 October 2014. ↑ "Marvellous Marveaux gets Guingamp going". UEFA. 2 October 2014. Retrieved 3 October 2014. ↑ "Sylvain Marveaux s'engage avec les Merlus" (in French). LFP. 15 July 2016. Archived from the original on 15 September 2016. Retrieved 15 July 2016. ↑ "De l'expérience avec Marveaux". AS Nancy. 26 January 2019. Retrieved 1 February 2019. ↑ "Anniversaire : Sylvain Marveaux". En Avant de Guingamp. 15 April 2016. Wikimedia Commons has media related to Sylvain Marveaux .